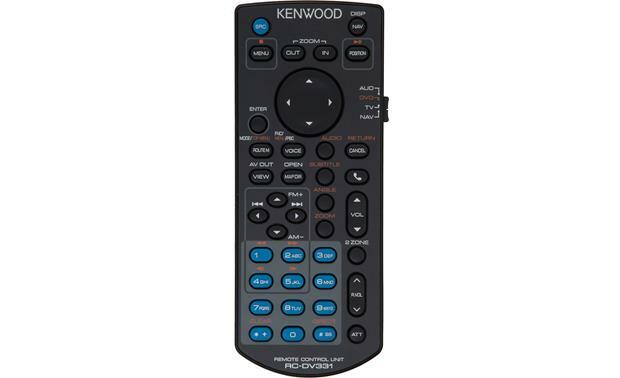 Need a remote for your Kenwood multimedia receiver? The KNA-RCDV330 works with many 2010-up Kenwood multimedia and navigation receivers. You'll enjoy outstanding control of your system. Warranty: 1 year. Not sure which remote goes with your receiver? Give our Advisors a call at 1-888-955-6000 and we'll help you find the right one. Does the remote require any additional wiring on the unit itself? Or does the unit already have a receiver in it for the remote? The remote works right out of the box! Compatibility: The Kenwood KNA-RCDV331 IR wireless remote control unit is designed to operate select 2010-up Kenwood multimedia & navigation headunits. Infrared (IR): The remote operates off of IR transmission so the KNA-RCDV331 must be pointed at the front-panel of your compatible Kenwood headunit within direct line of sight. Mode Switches: The functions operated from the remote controller differ depending on the position of the mode switch located on the right side of the KNA-RCDV331. You can select from Audio, DVD, TV or Navigation mode. Audio: The Audio mode of the remote controller allows you to operate functions of your compatible Kenwood multimedia headunit such as Source switching, Volume, Dual Zone, AM/FM tuning and iPod/USB playback. DVD: The DVD mode of the remote controller allows you to operate functions such as CD/DVD playback and file/track/folder searches. TV: TV mode allows you to operate TV band and Channel selection of a compatible Kenwood TV tuner. Navigation: Navigation mode allows you to operate either your Kenwood's built-in navigation receiver or compatible Kenwood external navigation unit. Numeric Keypad: The IR remote features a numeric keypad (0-9) which allows you to directly access tracks & chapters on a disc, or directly tune in a radio station. The numeric keypad also lets you enter a phone number during Bluetooth hands-free phone operation. Battery Powered: The wireless remote control operates off of two "AAA" alkaline batteries (included). Will this fit my Kenwood AV model VR 410? I'm not 100 percent sure, I bought it for my car stereo. It worked just fine for me with no need for setting it up. It had a wide range of kenwood products that it worked for. Will this work with ddx6705s? My experience is that the remote works with any KENWOOD product. I believe it will., I have a older Kenwood receiver and a newer One, I bought it to replace the one I lost and it will control both of them..
Will this remote work with the KMM-BT522HD? I bought this remote to go with my DDx9903S. The number buttons wont work if i want to go directly to a preset channel. i also have a kenwood dvd reciever in my truck with same remote it does the same thing. I can scan through the channels but i'd like to use the number buttons without having to scan through all the channels to get to a channel i want. Is there any way to get the number buttons to work with presets? Is it feasible to use this as a steering wheel control for the kenwood units? Is this remote compatible with the DDX794? I know that this remote is compatible with my ddx593 not sure about the ddx794. I have a DNX692. This remote works well with this unit. This remote should work well with all Kenwood products. The unit is already set up for the remote without any mods. Point and play. My unit is approximately a year and a half years old. Has Apple car play, DVD, etc. It did not require any additional wiring. It has a switch on the side so you can change from radio, DVD, etc. Also worked seamlessly on my wife's aftermarket Kenwood unit which is the upgraded version of mine with GPS. No it does not require any additional wiring. This is a "universal-type" remote and all that I've been able to get it to do is control the volume. DDX6703S compability with this remote? Thanks for your question. Yes it is. This remote is listed on the receiver's product page "Accessory" tab as being compatible. Hope this helps. Ddx374bt compatibility to this remote? Thanks for your question. Yes this remote is compatible with the Kenwood receiver you mentioned. Hope that helps. Does it work with the DDX773BH? Thanks for your question. Yes this is listed in the "Accessories" tab for the receiver as the compatible remote. Hope this helps. How perpendicular to the radio does this have to be pointed? If, for example, I mounted it to my steering column and pointed it in the general direction of the radio, would it work? This would be around a 15-degree angle probably. Or does it pretty much have to be out in front of the radio to work? I don't have mine mounted anywhere. So I haven't tried. In my personal experiences with this remote I would recommend using it like a TV. I just point mine directly at the screen and I don't have any issues with operating it. I hope this information helps. Will this remote work with the kvt7012bt? Thanks for your question. Yes it will. This remote is listed on the product page "Accessories" tab as being compatible. Hope that helps. what remote will work with my dx890 kenwood ? You will want to contact an Advisor by phone or online chat to discuss compatibility with your current receiver. They will be able to pull up your receiver and see if this remote will work with it. If it does not, then they will also be able to discuss other options with you. Searches related to the Kenwood KNA-RCDV331 Wireless remote for Kenwood multimedia receivers.